Plywood and white paint are known, respectively, as being cheap and bland … but the combination can make for a marvelous modern apartment with ample storage and surprising spaces (that does not cost overly much to renovate into shape). Two rooms and one dividing wall were the starting point for this remodel in Barcelona by Arquitectura-G (photographs via?Jos? Hevia). From there, the living-and-bedroom half was spliced with a ceiling-hung bedroom loft (hopefully for someone who does not roll over in their sleep!) and packed with built-in cabinets, cubbies, and staircase drawers. On the other side, a clean and simple kitchen again uses white as the backdrop and light ply to accent the core cooking area, with a slim mobile metal island floating in front of it that can double as a small dining-room table too. 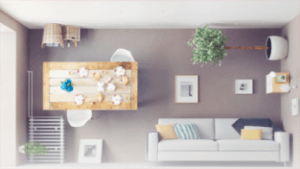 Photos only go so far in depicting a pair of relatively tiny rooms, though – these 3D-projected sectional drawings are a great visual aid to help comprehend the split-level and dual-room experience. The beauty of this interior lies in part in its status as an apartment – for a full-time, rest-of-your-life home it might seem a bit austere, but as a rental or otherwise temporary urban dwelling it conveys a clear and clean simplicity that sells it as freshly remodeled. With only a few dozen square meters to work with, light-colored wood and paint also help it feel bright and open.